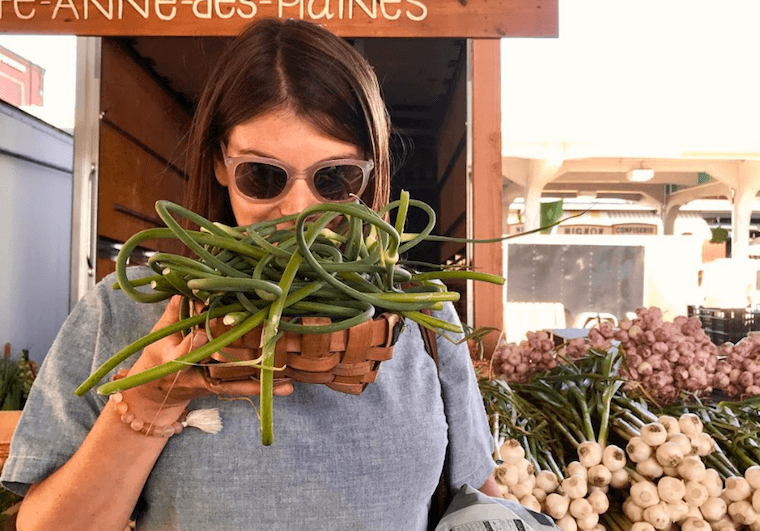 As a judge on Top Chef, Gail Simmons has developed a discerning palate. While filming, Simmons sometimes ends up having to taste as many as 75 plates in a sitting. But when it came to crafting recipes for her new cookbook, Bringing It Home, she focused more on family favorites—not the exotic cuisine she often tries on TV. Simmons’s other go-to recipes include the produce-packed warm farro bowls with roasted cauliflower and kale and simply grilled halibut with basil garlic green sauce. “Each recipe is based in the familiar but has a twist in it. Everyone sees wellness and healthy food in different ways. I believe to live the best life you can live, that means taking some risks with your food and trying something new,” she says. Scroll down for three recipes from Bringing It Home. Think of this easy but delicious yogurt drink as a next-level, sophisticated hybrid of your favorite anti-inflammatory turmeric-based beverage and a traditional mango lassi.“I make this for breakfast sometimes,” says Simmons. Toasted coconut flakes and pistachios add a nice finishing touch. 1. In a small, dry skillet over medium-low heat, toast the coconut flakes, occasionally shaking the pan back and forth, until the coconut is lightly fragrant and golden, about five minutes. Remove from the heat and let cool. 2. In a blender, puree the yogurt, with the mango, coconut milk, ginger, turmeric, salt, pepper, cinnamon and ice until well blended and frothy. 3. Divide the lassi among four glasses. Serve cold, topped with the cooled toasted coconut flakes and chopped pistachios. Simmons keeps “simple salads” like this one on repeat at home. “Since I’ve had a child I’ve spent more time in my home kitchen and am very conscious of what I’m cooking,” she says. Spicy greens like arugula and dandelion meet cooling avocado and a sesame-based Tahini dressing, while sunflower seeds add a flavor-packed crunch—you won’t even miss the croutons. 1. In a medium bowl, whisk together the lemon juice, tahini, garlic, Aleppo pepper, salt, and water until smooth. Set aside dressing. 1. In a small skillet, stir together the sunflower seeds, oil, cumin, ginger, and 1/8 tsp salt until well combined. Cook over medium heat, stirring constantly, until the seeds are fragrant and lightly golden, about four minutes. Remove from the heat and set aside to cool. 2. Using a sharp vegetable peeler, peel the carrots lengthwise into ribbons (you will have a few carrot scraps, which can be saved for another use or an instant snack). 3. In a large bowl, combine the carrot ribbons, greens, avocado, and a generous pinch of salt. 4. Drizzle the Tahini dressing over the salad and toss to combine. Adjust the seasoning to taste. Sprinkle with the sunflower seeds and Aleppo pepper, if desired. “I make a lot of soups and stews,” says Simmons. “You can make them in a big quantity and eat them through the month.” Besides this hearty tomato soup that comes with a ton of healthy topping options to help you make it your own, Simmons is a fan of her so-called fully loaded chicken and matzoh ball soup, which has fiber-rich barley in it. 2. Place the bread cubes in a large bowl and add cold water to cover. Let stand 10 minutes. 3. Meanwhile, spread the almonds on a baking sheet. Bake until lightly golden and fragrant, eight to ten minutes. Transfer to a plate and let cool. 4. Drain and firmly squeeze the bread to remove the excess liquid. In the bowl of a food processor or blender, purée the drained bread, toasted almonds, tomatoes, red pepper, vinegar, garlic, paprika, salt and one quarter teaspoon pepper until smooth. With the machine running, slowly drizzle in the oil. 5. Chill the soup until very cold, at least two hours or overnight. Stir in water, 1 tablespoon at a time, to thin slightly if needed. To serve, sprinkle with toppings and black pepper, and drizzle with oil. Reprinted from BRINGING IT HOME Favorite Recipes from a Life of Adventurous Eating by Gail Simmons. Copyright © 2017 by Gail Simmons. Reprinted with permission from Grand Central Life & Style. All rights reserved. Gail Simmons isn’t the only big name with a new cookbook out—Zac Posen has one, too. Plus, what to serve at a dinner party that everyone from vegans to Paleo eaters will love.